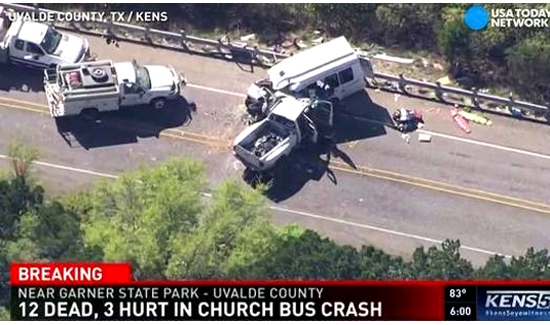 UVALDE, Texas — Twelve people were killed and three others were injured Wednesday when a pickup truck slammed head-on into a van carrying 14 senior members of a Texas Hill Country church on a two-lane highway in southwestern Texas, authorities said. The crash happened about 12:30 p.m. Wednesday on U.S. 83 outside Garner State Park, about 75 miles west of San Antonio, said Sgt. Conrad Hein of the Texas Department of Public Safety. It was unclear if the lone occupant of the pickup truck was among the dead or how many of the dead were among the 14 aboard the church van, Hein said. Photographs and video from the scene showed heavy damage to the front drivers’ sides of the small white bus and pickup truck, which are the portions of the vehicles where they appear to have collided. The back of the bus was up on a guardrail and debris was scattered onto the grass below. The 14 in the van were senior members of the First Baptist Church of New Braunfels, Texas. In a statement posted on the church website, church officials said the members were returning from a three-day retreat at the Alto Frio Baptist Encampment in Leakey, about 9 miles north of the crash site. The statement said church officials hadn’t learned how many fatalities and injuries resulted from the crash. However, they were “ministering to family members to help them deal with this tragedy.” Also, counselors were scheduled to be available at the church on Thursday.